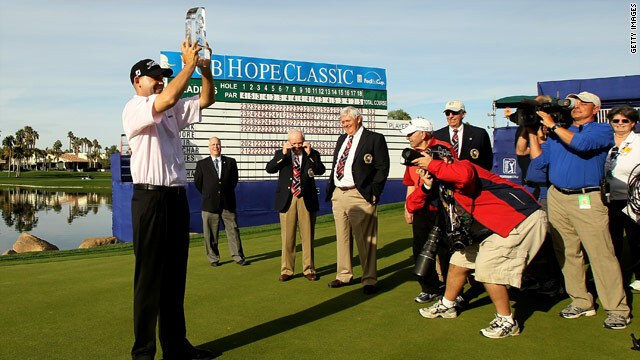 American Bill Haas celebrates his victory at the Bob Hope Classic which his father had won back in 1988. American Bill Haas claimed a one-shot victory in the Bob Hope Classic on the final hole to join his father as a winner of the tournament. Tim Clark, Matt Kuchar and Bubba Watson all finished tied for second place on 29 under. Haas completed victory with a birdie four at the last hole after he struck a brave tee shot to match his father's win in 1988. (CNN) -- American Bill Haas claimed a one-shot victory in the Bob Hope Classic on the final hole to join his father as a winner of the tournament. The 27-year-old went into the final day in California a stroke behind the lead but was able to break clear of the pack with a flawless 64 to finish on 30 under par. Haas led by two strokes after an fine start but the chasing pack reduced his lead and a birdie on 17 put him level with leaders Clark and Kuchar. He completed victory with a birdie four at the last hole after he struck a brave tee shot. Haas fired his approach at the last to within 27 feet and two putts were enough to seal a victory that matches the win his father - Jay Haas - secured at the same event in 1988. Haas, who was watched by his father, admitted the victory was even sweeter with a large family contingent present. It's pretty special as I didn't know my dad was here. "It's pretty special as I didn't know my dad was here. My dad and my brother and his uncle were there," Haas told the tournament's official Web site. "They knew they flew back from Hawaii last night, I thought maybe if I was in contention they might show up, but didn't see them until the end there. "It's not easy to win. I was so nervous coming down the stretch. I still don't know how I hit the shot on 18 - my hands were shaking."